Pre-Engineered F-Theta Lenses: Don’t have a complete design? No problem! 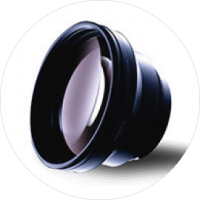 Our Pre-Engineered lenses give our customers the option to choose from a variety of preliminary designs based on what suits their application best. Just tell us your required specifications (dimensions, wavelength range, etc.) and our team of expert engineers will optimize our preliminary designs to meet your exact needs. This will save you the hassle of fully designing a product from scratch and help reduce or eliminate design fees! To learn more, please feel free to contact us at +1 732-321-6915 or info@shanghai-optics.com. The F-Theta scanning lenses are commonly used in laser scanning systems that employ two-axis galvanometers to scan a specified area but cannot tolerate the angle at the image plane. By introducing a specified amount of barrel distortion in a scanning lens, the F-Theta scanning lens becomes an ideal choice for applications that require a flat field on the image plane such as laser scanning, marking, engraving and cutting systems. Depending on the requirements of the application, these diffraction limited lens systems can be optimized to account for wavelength, spot size and focal length, and distortion is held to less than 0.25% throughout the field of view of the lens. When should I consider Reverse Engineering a lens? How does Peak to Valley (PV) and Root Mean Square (RMS) affects the quality of your optic? Contact our sales engineers for your custom Design solutions today!